Nancy, a psychology professor, wrote this editorial to the NY times. Nancy is a 55 y/o woman who broke her leg as a child. She developed shortening and deformity. The valgus (knock-knee deformity) was causing arthritis and pain in her knee and the shortening caused back pain. An osteotomy and acute correction of the femur was performed through a percutaneous approach. 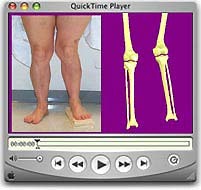 Gradual lengthening (4 cm) was accomplished with an EBI frame over 2 months to optimize leg lengths. Note the early new bone formation in the gap. The frame was removed after 6 months after complete bone healing. Weightbearing and exercise were encouraged throughout the treatment.